DID Electrical has something special for their customers this Valentine’s Day. The Irish-owned retailer are offering free delivery on all Valentines gifts over €50 online. They’ve also created a handy Valentines Gift Guide with loads of gorgeous gift ideas to help narrow down the search for the perfect gift, with gift ideas for him, for her and to suit every budget. The Fitbit Charge 3 Advanced Health and Fitness Tracker combines fitness tracking, sleep monitoring, heart rate tracking and smartphone notifications. The device is water resistant up to 50m and it has up to an impressive 7-day battery life. Now only €139.99 (save €10) plus free delivery. 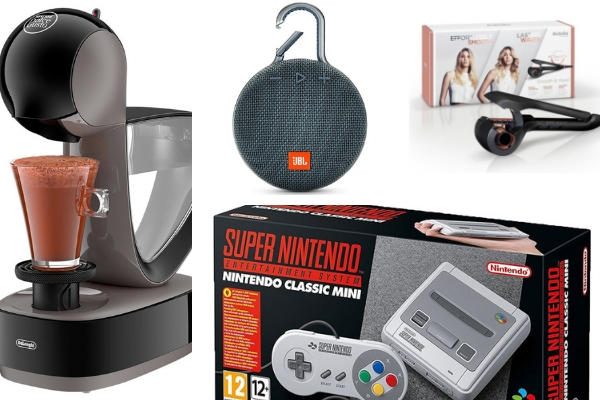 The Nintendo Classic Mini Super Nintendo Entertainment System, blast back to the 90’s with 21 nostalgia inducing games, only €89.99 plus free delivery. The JBL Clip 3 Wireless Portable Bluetooth Speaker is the ultimate outdoor companion speaker. Ultra-portable, rugged and waterproof and offers up to 10 hours of playtime. Now only €59.99 save €10, plus free delivery. The DeLonghi Infinissima 1.2L Coffee Maker, a great value pod coffee machine. It’s easy to use, has a compact design, and a power saving function. Now only €69.99 save €130.00 plus free delivery. And the Babyliss Ultra-Fast Smooth & Wave Secret Hair Curler with auto styling technology for easy straight smoothing or long-lasting waves. Now only €149.99 save €20 plus free delivery. DID Electrical is an Irish owned family business. DID Electrical started with one-man, a van and a vision of making people’s lives easier. 50 years later they’re a family of over 250 people, working across 23 stores, helping millions online and in store visitors each year. They guarantee the best in customer service, advice, support and a wide range of quality household appliances and tech at Ireland’s lowest prices.